Obituary – Rutherford, Rufus J. 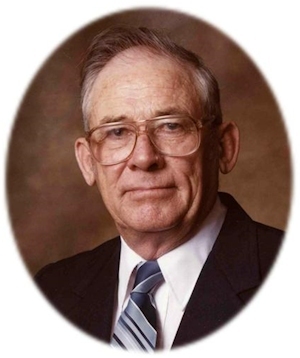 « Perry High School Alumni Association, Inc.
Obituary – Rutherford, Rufus J.
Rufus J. Rutherford, 89, of Perry, Oklahoma was the son of George W. and Nora O. Churchwell Rutherford. He was born on the family farm, northwest of Perry, on December 27, 1919 and died Tuesday, April 21, 2009 at Green Valley Nursing Home in Perry. Rufus received his education, grades one through eight, at the country school 4-D District 31 in Noble County. He graduated from Perry High School in 1938. He and Ruby E. Schultz were married at Perry, Oklahoma on November 4, 1941. On April 2, 1948, Rufus accepted a position as lease operator with Gulf Oil Company where he was employed for 36 years until retiring on April 2, 1984. Rufus had been a member of the First Assembly of God Church in Perry since 1940 and served as a Deacon, Sunday School Superintendent, Sunday School Teacher and Church Secretary-Treasurer. He held an amateur radio license and his interests were crafts, woodworking and electronics. Funeral services will be at 1:00 p.m. Saturday, April 25, 2009 at the First Assembly of God Church in Perry. Rev. Brett Nation will officiate. Interment will be in the Sample Cemetery at Lucien, Oklahoma. Services are under the direction of Brown-Dugger Funeral Home. The family will receive friends from 6:00-8:00 p.m. Friday, April 24, 2009 at Brown-Dugger Funeral Home. Memorials may be made to the First Assembly of God Church Building Fund or Companion Hospice in care of Brown-Dugger Funeral Home, 1010 N. 7th Street, Perry, OK 73077. In addition to his wife, Ruby E. Rutherford, Rufus is survived by his children, Marie Oliver and her husband, Larry, of Burlington, Iowa, Harvey K. Rutherford, of Woodward, Oklahoma, Larry K. Rutherford and his wife, Donna, of Cleveland, Oklahoma, Lonnie Rutherford and his wife, Iona, of Billings, Oklahoma, Linda Luthye and her husband, John, of Perry, Oklahoma and Stan Rutherford and his wife, Sheryl, of Bethel, Missouri; seventeen grandchildren, twenty-three great-grandchildren; and one sister, Reba Fish, of Perry, Oklahoma. He was preceded in death by his parents, George and Nora Rutherford; seven brothers, George N., Archie P., V.E. Lee, Robert W., John L., Wilbur L. and Ralph; four sisters, Ruth Geraldine, Bonnie G., Nora M. and Jesse; one grandchild, Sara Faye Rutherford; two great-grandchildren, Shelby Harris and Seth Harris; and one daughter-in-law, Jean Rutherford.